1974 We published a leaflet Brighton Going? The Society submitted written and oral evidence to the Dobry inquiry, set up to look at changes in planning control. It actively supported the Greater Brighton Structure Plan. We opposed to the Department of the Environment’s A27 Brighton By-Pass proposals and called for an improvement to public transport and restraint on the use of cars in the town centre. 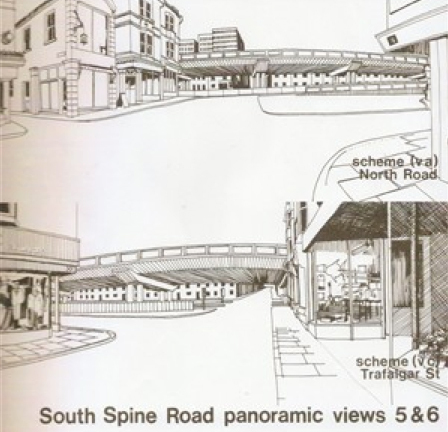 We were successful in getting the London and the Lewes Road viaducts listed, we had hoped to see the latter as a walkway across the town, but it was subsequently demolished to make way for a Sainsbury’s supermarket. We were also successful in getting the Department of the Environment to refuse listed building consent for the demolition of the Percy & Wagner Almshouses. We helped to launch a ‘Save the West Pier Campaign’. The Society was supported by the Victorian Society and the Royal Fine Art Commission. 1978 : We were the only Society in East Sussex to be invited to take part in the debate on shopping provision at the Examination in Public of the East Sussex Structure Plan. 1979-80 : We commented on the plan for the Cox’s Pill factory site. We supported the George Street Society and the Black Rock Action Group but failed to save the Black Rock swimming pool, which could well have been listed. We supported the Council at the public inquiry into the demolition of 30-32 Madeira Place, which was successful. We published a leaflet ‘A Walk about the Best of Brighton’. We supported the Kemp Town Conservation Society in their opposition to proposals for the Black Rock site. We gave evidence at the public inquiry into the multi-storey car park in King Street; where we were given the opportunity to cross-examine Council officers and a councillor, though the scheme was eventually allowed. We were awarded a grant by the Manifold Charitable Trust to publish a short paper on Brighton’s derelict sites. A couple of our members assisted Hove Borough Council in providing evidence for their floorscape survey. We published a leaflet ‘The Craftsmen & Materials for the Care of Old Houses’. 1981-82 : We gave evidence at the public inquiry into the Brighton By-Pass and were given the opportunity to cross-examine several witnesses. A planner commented “the Brighton Society speaks for many more citizens than just its members”. 1982-83 : We strongly opposed plans for a seafront hotel built across Lower Market Street obliterating the view of the sea and cutting off the reflected light which lit up the Lanes. We therefore opposed the road closure, but regrettably gave in when the developer promised a view of the sea through the hotel, which has not materialised in a meaningful way. 1983-84 : We were successful in preserving North Place after there had been several attempts to demolish it. We supported the Council at the public inquiry into the pedestrianisation of Duke Street. 1985-86 : The Craftsmen & Materials for the Care of Old Houses’ leaflet, first published in 1980, was updated and re-issued. 1986-87 : The Society was concerned about the Council’s intention to demolish Roedale Farm in Hollingdean and to build 81 flats in a tower on the site. The RIBA Community Architecture grant of £700 was awarded to the Society to commission a feasibility study for a housing scheme which included the retention of the farm. The Council changed its mind in favour of a low rise plan which included the retention of the forge. 1987-88 : We succeeded at the second attempt to get the Diocesan Training College listed, though we failed to get the Parochial Offices in Princes Road and the Tower House in Preston Road listed. Representatives of the Society were invited to accompany Stephen Gardner, Architectural Correspondent of the Observer, on a tour of the town. We published a leaflet ‘New Windows for Old’ , to show the damage done to old buildings by the insertion of inappropriate modern windows. 1988-89 : With the Montpelier & Clifton Hill Association we campaigned to change ‘Breeze into Brighton’ (a scheme to encourage cars into the town centre) into ‘Freeze the Breeze’ (to limit the number of cars in the town centre). The ‘Breeze into Brighton’ scheme was abandoned. We published a leaflet of Environmental Information for Brighton & Hove. with a grant from the Department of the Environment. 1989-90 : Jointly with English Heritage we succeeded in persuading the Department of the Environment to put a ‘stop order’, and subsequently to ‘call in’, the plan to demolish the Parochial Offices, minutes before permission was to be granted by the Planning Committee for demolition and its replacement with an undistinguished office block as recommended by the Chief Planning Officer. 1990-91 : At the public inquiry into the plan to replace the Parochial Offices we presented our case against demolition in tandem with English Heritage. Brighton Housing Trust submitted a planning application for 38 low rise flats including retention of the Roedale Dairy in Hollingdean was granted (see 1986-87). 1991-92 : The Secretary of State refused permission for the demolition of the Parochial Offices (see 1990-91) a great victory! It was subsequently converted to flats. 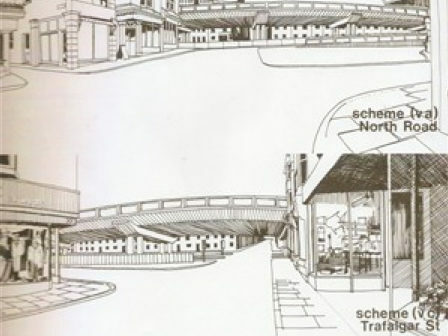 1993-96 : The Society welcomed new scaled down plans for Jubilee Street, the ice rink and car park in previous plans were dropped and replaced by a new library and retention of the small scale buildings in Church Street. We repeatedly objected to the Council’s scheme to put a supermarket and Park & Ride site on Patcham Court Farm. 1996-97 : We were very concerned about one of the schemes for the Dome, in which large rectangles were pierced into the wall along Church Street, and filled with brightly coloured plastic panels, fortunately the proposal was dropped. 1997-98 : The Regency and Brighton Societies were successful in getting Marlborough House upgraded from Grade II to Grade I, a public inquiry into its use as a public house was held and the scheme dismissed. 1998-99 : We gave evidence on the impact of a supermarket and surface car park on St Bartholomew’s church at the public inquiry into proposals for the Brighton Station site, this was subsequently one of the reasons the Inspector gave for dismissing the first scheme. We supported BUDD in their opposition to the scheme and their stance at the public inquiry. 1999-2001 : Our major objections to the Local Plan were a supermarket on the Brighton Station site, a Park & Ride site at Waterhall and high tech offices on the site of Patcham Court Farm. We welcomed Article 4 Directions in a number of Conservation Areas, providing new controls over changes to the fronts of houses. 2001-02 : We objected to the enabling scheme for huge glass boxes at the root end of the West Pier, intended to fund the repair of the Pier. We visited Stanmer House, to inspect the poor state of the interior. A giant Tesco was proposed on the Hove gas works site, sadly the outline permission allowed demolition of the flint wall along New Church Road, the manager’s flint villa and the old gas showroom. 2002-03 : One developer proposed 4 unacceptable schemes: a tower on the Endeavour site, the ‘Banana’ building in North Road, an arrogant house at 1A Connaught Road and the King Alfred scheme. The first two schemes were dropped, 1A connaught was unfortunately built, but the King Alfred thankfully failed to get permission. We welcomed the scheme to restore Stanmer House, the result is dramatic. The grade I listed West Pier was burnt down, there were 2 arson attacks, a dramatic birdcage like structure remained as an island as its memorial. 2004-05 : The Chief Executive of the Civic Trust visited representatives of the Society to answer our concerns about the close working of the Trust with local developer, who they had appointed as their (unqualified and inappropriate) adviser on conservation and public participation, we considered resigning from the Trust. In spite of a well designed tower we were worried about the density of the Brunswick scheme for the outer harbour of the Marina. We looked at the schemes for the King Alfred and the 42 storey Beethan tower on the Brighton Station site with growing horror. On the whole we were pleased with the green credentials of the Jubilee Library. 2005-06 : We are appalled about the scale of the i360 tower at the foot of Regency Square, which we considered would make the Square look like toy town. We are concerned about the quantity, quality, size, affordability and location of the 40% ‘affordable’ flats now being required of 4 sizable developments along the seafront. 2006-07 : The appeal against the refusal of permission for the Beethan tower was dismissed by the Inspector, who quoted from our chairman’s expert evidence. We supported the Council and the North Laine Community Association at the inquiry. The Council subsequently thanked the Society for the support we had given them. We also supported saveHove and the Regency Society in their campaigns against the bizarre scheme for the King Alfred, a prime example of bad planning. 2007-08 : We joined the Montpelier & Clifton Hill Association and the Clifton, Montpelier, Powis Community Association in opposing the gross overdevelopment of the site of the Royal Alexandra Children’s Hospital. We welcomed the designation of the Carlton Hill Conservation area. 2008-09 : After 30 years of campaigning by the Brighton Society for the restoration of the Birdcage Bandstand it has been completed. Plans for the King Alfred were fortunately killed by the credit crunch. We objected to the proposal to demolish Varndean College, with support from the Preston & Old Patcham Society and the Sussex Industrial Archaeological Society, though we failed to get it listed. We supported the extension to the Brighton & Hove Sixth Form College, though neither scheme went ahead as the Learning and Skills Council failed to find the promised funding for the schemes. We objected to two almost identical proposals to add a glass box on top of the roof of the Old Market in Brunswick Town, we were expertly supported by the Georgian Group and the Brunswick and Adelaide Residents Group. An appeal has been lodged against the refusal of the scheme. 2009-10 We were sucessful in getting the Connaught Road Board School listed grade II. We were supported by the Victorian Society and English Heritage. The Brighton Society joined Civic Voice, the organisation which has superseded the Civic Trust which went into liquidation. The Brighton Society was the winner of the ‘Best Civic Society website’ Civic Voice award at their first AGM in 2010 and were awarded a certificate. The Brighton Society supported the Save Saltdean Lido campaign to oppose demolition of the grade II listed Lido and its upgrade its listing to grade to II*. We joined with several other local societies to oppose the closure of the History Centre at Brighton Museum, we were successful. 2011 The Society commented on the government’s National Planning Policy Framework and is involved in commenting on the City Council’s City Wide Plan. Hove Library is 110 on Sunday July 8th!